Karen Edmisten: Feast after Feast! Two wonderful feasts are approaching! 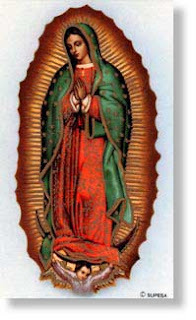 First, December 12 is the Feast of Our Lady of Guadalupe. My personal devotion to Our Lady of Guadalupe began about nine years ago, and is chronicled here. And, I began last year to try doing a bit more with the kids on this feast. My girls' godmother helped out in that department when she had the kids put together a little play about St. Juan Diego, which was just delightful. This same godmother is the one who originally led me to the St. Lucia braided bread recipe that we always look forward to. 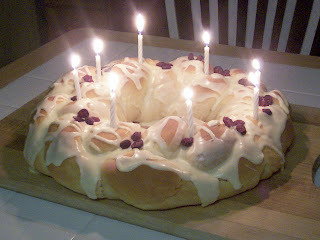 You can visit this post for more details and links on our St. Lucia celebrations, and this one for the recipe for the bread. You can't ruin this bread! Don't be afraid of it. If I can do it, you can, too. And you'll be so happy you did. It's beautiful and delicious. And, it will be gone before you can say, "Gaudete Sunday." Abby made it (at our house even!) and it was wonderful. Of course it was made even more special because we now have a Luci who whom we can celebrate St. Lucy's Day with. Her St. Lucy's Day present - a pair of fuzzy pink mittens knit by Grammy. Just in time for snow storms.